cncCoder is free software - it doesn't contain any hooks, pop-up ads, nag-screens or anything like that. Free Software ? What's the catch ? We understand that many users will want to edit CNC files in the office on a desktop computer while their DNC software is running on a different computer "out in the shop" - So if you've already bought your DNC software then you really don't want to buy another just so that you can edit CNC files while you're away from your DNC workstation. 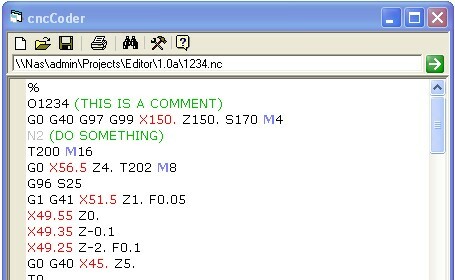 cncCoder is supplied to you at no cost - It's a fully functional CNC text editor identical to the one you'd get if you used easyDnc, our popular DNC software - You can install cncCoder on as many computers as you want. You can share it with colleagues and use it for as long as you want. Why are we giving you this free software ? Files created and edited using cncCoder are 100% ISO/ASCII compatible so should also be compatible with most other CNC and DNC software so you don't need easyDnc.. But, because we make easyDnc AND cncCoder it stands to reason that both packages work well together - easyDnc can load cncCoder when required and cncCoder can load files directly back into the easyDnc workSpace ready for uploading (DNC) to the CNC. Free CNC text Editor - fanuc, bridgeport, hass, sinumerik, okuma, cubotic, traub, index, pullmax, seiki, dynapath .... too many to mention. Copyright (c) 2006 Axis Controls Limited.